Triangles: What Do You Think? This is just up on the design wall, not sewn, and I’m thinking of taking out the really scrappy ones. They kind of jar my nerves. But, what do you think? It’s good to have opinions from quilty friends! This entry was posted in Modern Quilts, Quilt Design, Quilting and tagged batik quilt, scrap quilt, triangle quilt by zippyquilts. Bookmark the permalink. I like order and pattern so I agree that a whole bunch of the scroppy ones might not be best, but I also ALWAYS put deliberately wonky blocks in my quilts somewhere, so I say keep a few and pop them into random spots. 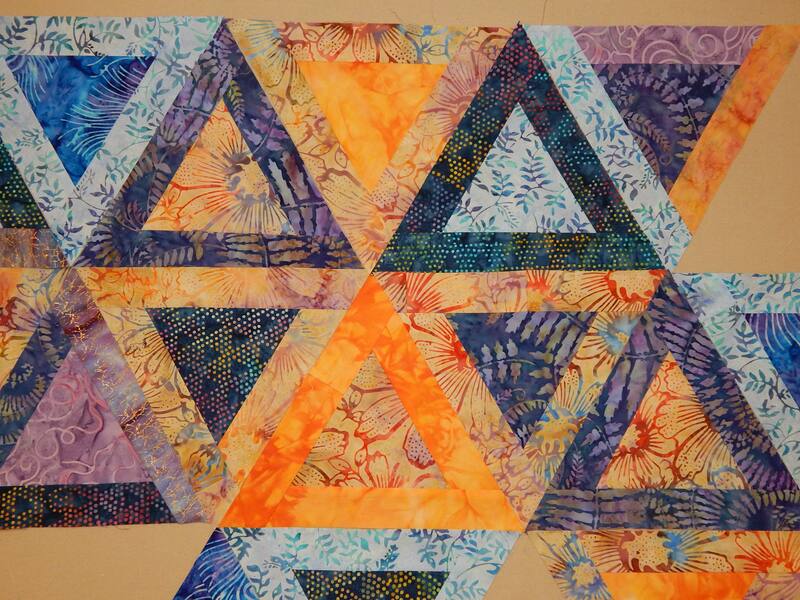 The batiks and double triangles are looking beautiful to my eye. Keep going. I like the idea of at least one wonky block per quilt! Thanks! I agree with removal of the scrappy triangles—too distracting. The rest of them are stunning together! Thanks, Linda. Yes, we quilters LOVE control! I tend to be wonky, and not only in my quilts…but, I do like the ordered look. 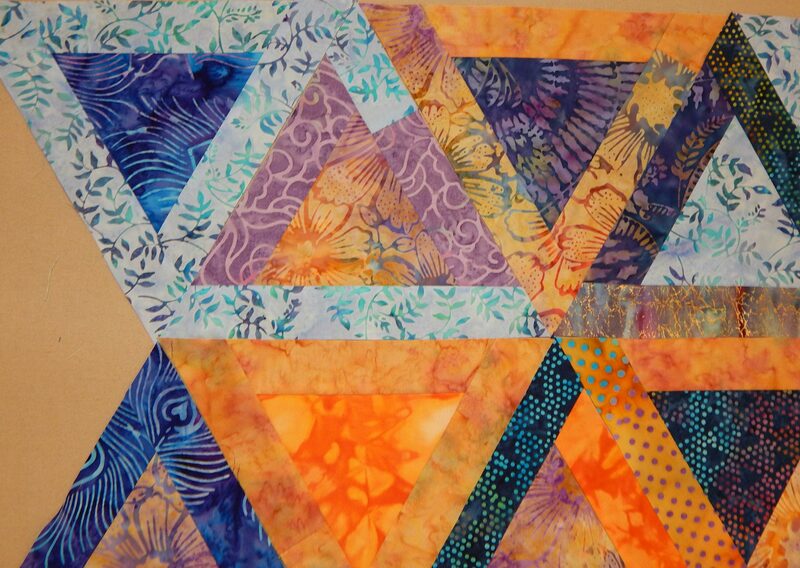 I have batik scraps that I had no idea of how to use…I never thought of triangles. This looks great. Thanks. This a pattern called Wild Waves, free on the Moda site. Go for it! I love your inspiration fabric. I think I would use it as the center triangle in the block and scraps around. Wonderful idea! 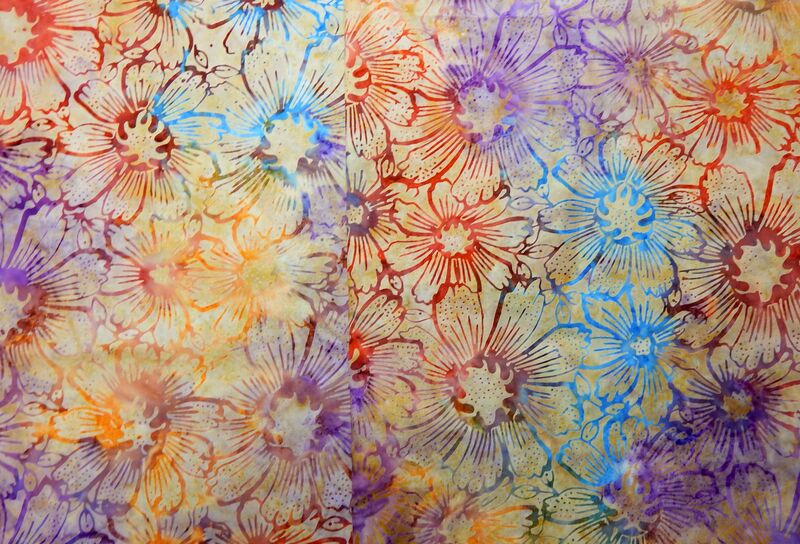 I’m partial to scrappy in my approach to quilts, but, I think the way towards using this gorgeous batik is in the more ‘ordered’ look of your triangles. It still satisfies my personal like of ‘scrappy’ without actually being so. Great way to deal with batiks. I, too, have had a hard time making sense of how to use such a one as you have shown here in any quilted piece. I’m leaning towards ONE scrappy triangle and the rest controlled. Thanks! When it’s done (!) please point out which one is the ‘scrappy’ one – I’m curious as to how it will shape the entire quilt, you know? I rather like the scrappy ones that repeat a fabric near them. Doesn’t seem totally out of control. But I agree with having the majority more unified. It’s beautiful. I love batiks AND scrappy quilts, so this is very appealing. I do agree that the ones where the sides are one piece of fabric and not several prints are nicer though. Can’t wait to see it. Will you have the entire quilt be the triangles or just a section?I’m about to embark on a queen quilt and open to idea. Thinking medallion but these are beautiful blocks. I am thinking of having one very large triangle and a couple of groups of small ones for fun. But the whole thing will be triangles 😀. Good luck with your queen quilt! I think this is lovely and if it were mine (wish, wish)I would also leave out the scrappy bits. Really pretty. I’ve used the batik at the top of the page. It works so much better with your project than in the ones I used it for (though I did manage to get it to work, this is more natural.) If you don’t like the scrappy blocks, you could use them for the back, perhaps? I love your triangles and the color arrangement.